It is necessary to discuss separately certain issues specific to sea water. The ideal solution would be to use two filters: one with a moderate flow, mainly for the conversion of nitrogenous matter (a box or wet-dry filter), the other with a stronger flow, priprimarily serving a mechanical function. 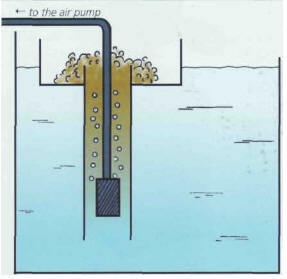 An under-gravel filter can also be used to enhance the circulation of water in the generally fairly thick sediment, but it must not be used on its own. 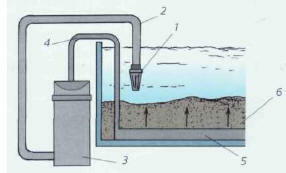 One effective combination consists of a reverse-flow undergravel filter coupled with an external filter (see box). The filtration flow must be 3-5 times the volume of the tank per hour for fish, and up to 10 times the volume for invertebrates, especially Anthozoans. Once again, foam is the perfect material, providing it is no more than 6-8 cm thick. If thick materials, such as crushed oyster shells or PVC materials, are used, then the foam can be thicker. Never use peat or active carbon. Marine fish are more sensitive to the quality of the water than freshwater species. This calls for the use of equipment to complement the filtration system, in order to obtain water of the highest quality. The water passes through the substrate from the bottom to the top, more for oxygenation than filtration. There are no particles to form sediment, as these are sent back in suspension into the water, which is filtered by an exterior system before being propelled under the sediment. This type of filtration is sometimes used in large marine aquariums containing fish, thereby avoiding any possible problems resulting from a lack of oxygen in the bed. This system enables the aquarist to carry out partial chemical purification of the water by eliminating certain dissolved substances, such as proteins. The principle is simple: the water is agitated in a confined space, leading to the precipitation of a number of substances. A frothy foam, often yellow-colored, is produced, and this is then eliminated via the overflow. 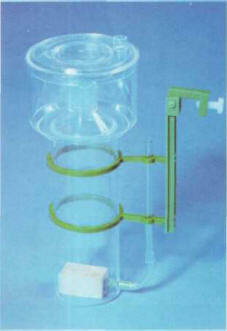 The protein skimmer, specific to sea water, eliminates certain dissolved substances and helps purify the water. The protein skimmer is an independent element that can be placed anywhere in the tank. It can also complement the filtration system, reducing the burden of a box filter when it is installed in its first section. Also very often employed as a preventive measure in tanks containing fish, the protein skimmer is not used if the tank is not overloaded, and if a biological filter is already working effectively. The agitation of the water with a protein skimmer precipitates a foam made up of substances to be eliminated. The protein skimmer is recommended for an invertebrate tank, especially one with corals and anemones, although it does eliminate some substances that are absorbed by invertebrates. Aquariums of up to 300 liters use a protein skimmer fed by a finebubble diffuser, and therefore supported by an air pump. Beyond these volumes, plan on installing two protein skimmers, or invest in one fed by an electric injection pump. Ultraviolet rays are luminous, but invisible to the human eye. Some of them are responsible for tanning (UV A and B), while others, with a shorter wavelength (UV C), have germicidal properties and kill a large number of bacteria and viruses. These UV rays are used for the bacteriological purification of water, especially as their action is selective, as they do not destroy the "good" bacteria of the nitrogen cycle. The field of action of these rays is limited - somewhere in the order of a few centimeters. The water must therefore pass close to the source of the rays, at a speed which allows it to receive sufficient amounts of their luminosity. In order for the rays to exert their maximum effect, the water must be clear, and therefore well filtered. UV sterilizers are commercially available. Again, the principle is simple: a lamp, usually a tube, sends out rays, and the water is pumped around it. The power of a UV system and the flow of the water around the lamp vary according to the volume of water being treated. The lamp is completely watertight, thanks to a quartz sheath that allows this type of ray to pass through. The blue-violet color given off by the lamp only serves to show that it is functioning. Do not look directly at the source of the UV rays, as they are dangerous for the eyes — this is why the sterilizer usually has an opaque covering. The lifespan of a lamp operating for 24 hours a day is around 5 or 6 months. However, the quality of the rays usually deteriorates after 4 months, and so they should be replaced three times a year. ЧАСТЬ И ЦЕЛОЕ , философские категории, выражающие отношение между совокупностью предметов и объективной связью, которая их объединяет и приводит к появлению новых свойств и закономерностей. Эта связь выступает как целое, а предметы - в качестве его частей. Свойства целого несводимы к свойствам его частей.